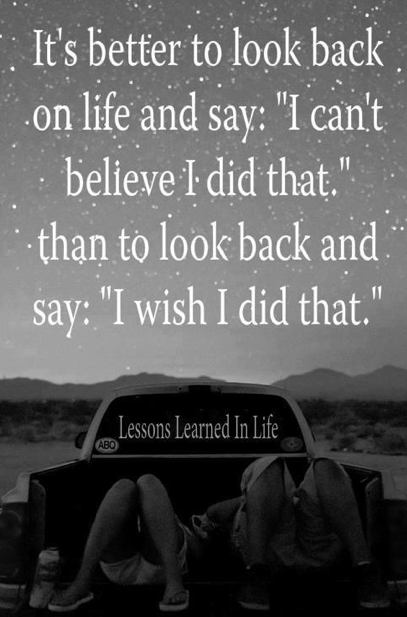 Don't live your life with regrets. You never want to wake up one morning, wishing your actions were different. You need to live life to the fullest. Enjoy each day and take advantage of each moment. What a terrible feeling it would be to look back at a life that was wasted. Spend time with family and friends. Travel the world. Learn all you can about everything in the world around you. Be courageous. Go for things you never once thought you would ever receive. Don't look back at what could have been. Instead, look back and smile. This image was shared on Pinterest by Kaylie Jones.